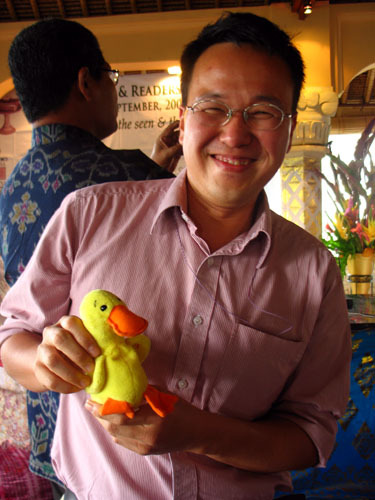 Ducky meets Tan Twan Eng, author of “The Gift of Rain”. For more photos of Ducky’s most recent adventures in Bali and Thailand, visit his flickr album. I’ve been neglecting this again. Taking photos but not uploading. There’s still photos of his visit to America that I haven’t processed. Ah, well. Looking at the album cheers me up though. I can’t believe how far one little duck has gone. Next Nanowrimo, I don’t know.